[dropcap]A[/dropcap]ll ready for the first day back at school? For the students of Captain Michael VandenBos Public School here in Whitby, the first day back after summer break holds an extra frisson of excitement. Necks will be craned, eyes shaded – a sea of faces will tilt skywards as one, each ear straining to detect the first sound of jet engines. 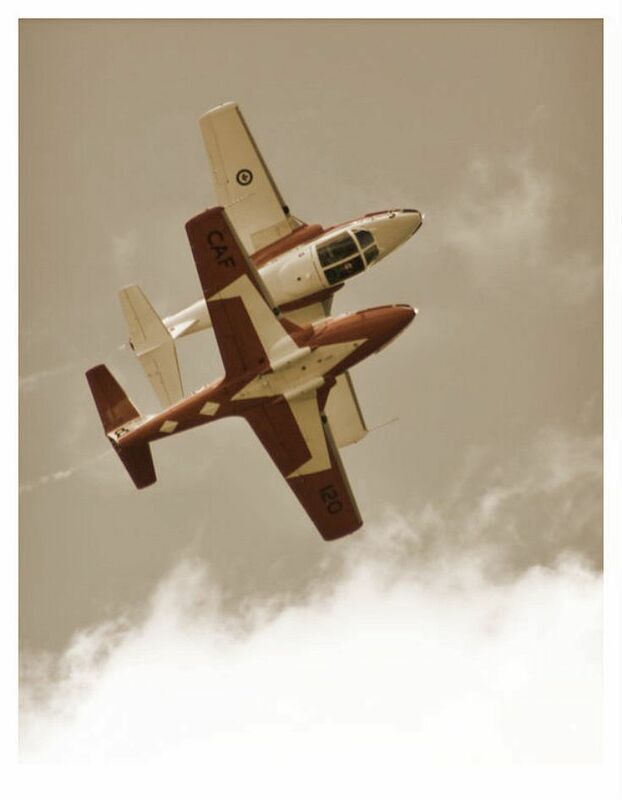 At 12.30pm without fail, to the collective pride and delight of the local community, Canada’s elite flying team will thunder overhead in heart-stopping, window-rattling characteristic tight formation. This annual fly-by means as much to the members of the squadron as it does to those below; it’s a salute to the memory of one of their own. 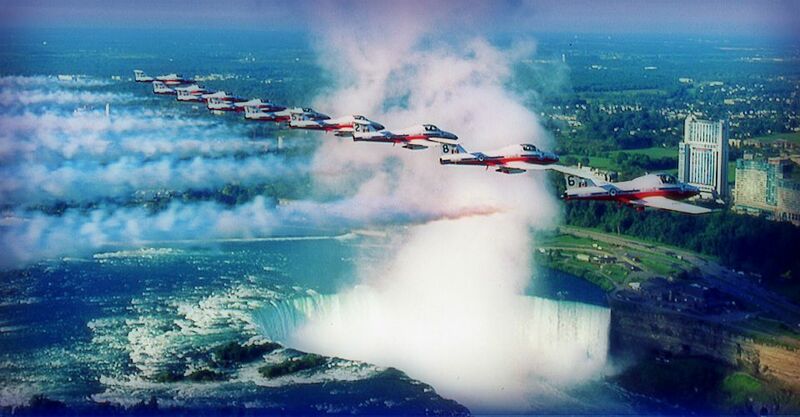 The Snowbirds are Canada’s equivalent to the UK’s Red Arrows. Officially known as the Royal Canadian Air Force’s 431 Air Demonstration Squadron, they’re Canada’s military aerobatics team based at CFB Moose Jaw in Saskatchewan. Performing complex manouevres at 600km per hour just 1.2m apart, they’re the epitome of practiced perfection, unshakeable concentration and iron nerve. Their jets are CT 114 Tutors, designed for training not fighting, and while they don’t perform at the same speeds as the Red Arrows, the distance between each plane is almost half that of the RAF team and the sight of nine jets performing such manoeuvres in formation has been described as ‘aerial ballet’. ‘Michael VandenBos grew up in Whitby. He was a young man with a childhood dream to become a member of the Snowbirds. He worked hard to achieve this goal and was in line to become the commander of this group. Tragically, he died in a routine training mission south of Moose Jaw, Saskatchewan on December 10, 1998. The Durham District School Board decided to honour his memory by naming a new school after this remarkable young man. The Snowbirds pay homage to a member of their own each first day of school with the “flyby”. The children of the school are encouraged to develop positive life skills in academics as well as extra-curricular activities by following Michael’s example. The children can display the “VandenBos Spirit” by participating in reading programs, sports, Spirit Days and other activities at the school. Perhaps one day, one of our students will be a pilot zooming over the school on the first Tuesday after Labour Day with new little ones waving enthusiastically at the Canadian Snowbirds! What a beautiful way of keeping a memory alive and an achievement relevant and meaningful to subsequent generations. Remembering ordinary people who were inspired to perform extraordinary feats is something Canada is particularly good at – stop by next week and find out who Terry Fox was and why every child in the country knows his name. Wow – what a wonderful way to start the school year – not just the excitement, but such a powerful message of respect, remembrance and recognition. I am always blown away when someone’s contribution to the world is recognized not simply by words, but instead by actions. Every child has just learned a valuable life lesson, on his or her first day of school. Brilliant. It does send a strong message, doesn’t it? I felt it just hearing the story, actually being in the schoolyard at 1pm, eyes heavenward, surrounded by others doing the same must be really something. I liked the observation you made about ‘when someone’s contribution to the world is recognized not simply by words, but instead by actions’ – like carrying on the relay baton. I remember the Snowbirds well. Always enjoyed their flypasts. We were skiing this weekend at a resort in New South Wales when five or six jets screamed overhead, colourful exhausts streaming across the sky. I promptly fell over on my skis, wondering if the world was about to end with all that noise. They could have sounded their horns as a warning. I mean, really. We look forward to the fly over every year. I went to high school with Mike. I remember that he was a very small boy with big blue eyes. He was very blonde, and had lots of freckles. He was always inquisitive, even back then, and never sat still. Although I was shocked and very sad to hear of his untimely fate, I was very proud that he had attained the status of flying with the Snowbirds. It’s a lovely honour to his family and his memory that his comrades do this each year over “his” school.